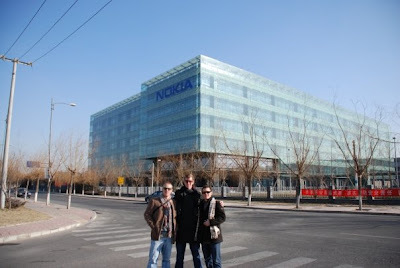 I recently had a chance to visit the Nokia China Campus in Beijing’s Economic-Technological Development Area (BDA). This building is a nice illustration of solid application of green building principles, but it also left me with the distinct impression that green building practices alone are only barely scratching the surface of what can be done to reduce carbon emissions. 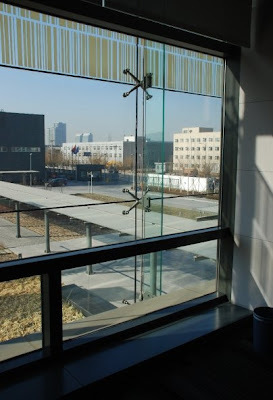 Nokia’s China Campus will be the new headquarters and R&D facility for Nokia China. The campus is a ~75,000 sm facility that will provide office space for 2,300 employees. The building received a LEED Gold rating, Nokia’s first LEED Gold building globally, but after the success of this process, they have upped their commitment and now will go for at least LEED Gold on all new buildings globally. I thought that was a nice example of the China business leading the global business toward sustainability. The building has a number of solid energy efficient design features. Most notable is the double skin facade. This prevents the outside temperature from affecting the indoor temperature, reducing heating and coolings needs. 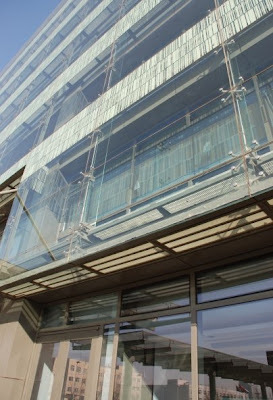 The double skin facade however still allows significant daylight in to the building, reducing lighting needs. 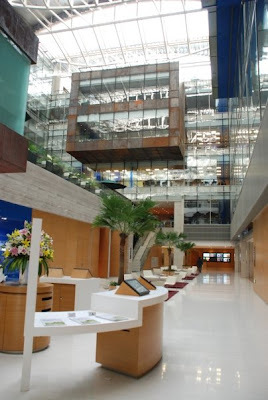 Arup, hired by Nokia to design the building, estimates that the double skin facade alone reduces energy use by 14%. The roof also features also massive skylights and a huge atrium, which creates a nice airy feeling in addition to reducing lighting load. The integration of these and other energy efficiency strategies resulted in a 20% savings over a baseline building. The building also features many water saving features, resulting in water use 37% below comparable buildings. From a sustainability standpoint, the buildings location is less than ideal: well outside of the city near the south 5th ring in the BDA. Nokia does try to minimizes this impact, however. 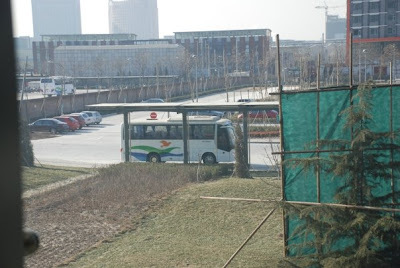 They provide convenient shuttle bus service to all their employees, 80% of whom take the shuttle to work everyday. Moreover, Nokia decided to make the move to the suburbs in order to consolidate its operations (and get some nice tax credits from the government), which helps to reduce travel time between the facilities. Most importantly, they have also encouraged many of their suppliers to move down to the BDA and co-locate. This has helped reduce the carbon footprint for their entire product supply chain. The building also has a strong focus on occupant well-being and productivity. In addition to open communal space, the campus also features restaurants, a gym and a nursery and a place of worship. The daylighting strategies also allow for significant light (but not significant glare) to enter the offices, which should enhance productivity. 97% of spaces have views of a window. The building was made with 27% local materials (defined by LEED as produced with 500 miles of the building), which reduces embodied carbon thanks to transit. Transit of building materials generally accounts for 10-20% of embodied carbon. Yet for all these green features, Nokia estimated it cost only 2% extra to build this LEED Gold campus. Add this building to the growing evidence that good integrated design can deliver high performing green buildings at very small additional upfront cost. 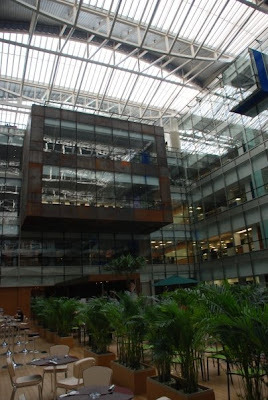 Despite all the cool green features of the building itself, I couldn’t help but think about the even greater opportunity to reduce carbon emissions right next door: in the older Nokia factory that produces cell phones for distribution in Asia. I don’t have hard numbers, but I have to suspect that the energy used in this production and distribution process far outweighs the energy used in the office building. This factory, built in 2001, had essentially zero integration with the recently completed campus building. And that is where the real opportunity lies. The next step is to take the principles of green buildings- integrated design and whole-systems thinking- and apply them much more broadly: to manufacturing processes, to factories, and even whole communities. I am not familiar with the particular manufacturing process of that Nokia factory, but I imagine it produces considerable waste heat. Why not take that waste heat and pump it next door to heat the office building during winter? I’m sure a closer look at the manufacturing process would reveal many more win-win strategies resulting from integration of the office building and the factory. And what about better integrating the manufacturing process with the factory building itself? It seems like most manufacturing processes are designed by mechanical engineers, and then merely placed inside the shell of a building. What opportunities are there to better integrate the process within the structure of the building, and use less energy to produce more? How can we improve resource productivity and not just labor productivity? These are still very much open questions. The barriers that already exist in the green building space- lack of coordination between all the different players, expertise bottlenecks, etc- are certain to be even tougher in making green factories that integrate with their surroundings. But the work will be worth it. Green factories, and particularly their integration with commercial and residential buildings, present a massive opportunity for reducing energy use and carbon emissions.